I pulled into the driveway and squinted at the sprawling green vine dotted with pink and purple flowers. I tilted my head to get a better look. Five or so snap peas. The boys clambered out of the van and began tugging the pods gently off of their vines and popping them into their mouths before I could sample one. Scooting past the fava beans that stretched up to greet the unseasonably warm January sun, I walked over to greet my neighbor- the same one I surprised last year by pulling a potato out of my front flower bed. We chatted about the weather, the economy and whether she would mind my planting a pomegranate tree where the front lawn used to be. I didn't always host a Victory Garden in my front yard. Once, a lawn spread neatly out from house to sidewalk. My trusty landscaper dutifully mowed and blowed our grassy expanses bi-monthly. Our yard was neat, clean, and fairly lifeless (if you discount the kids). 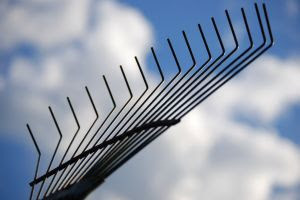 One day, about eighteen months ago, I read that "a traditional gas powered lawn mower produces as much air pollution as 43 new cars each being driven 12,000 miles" and that "home-owners apply ten times more chemicals per acre just on their lawns than farmers do on their crops." (Big Green Purse, 248). What was the point, I wondered, of carpooling or buying organic if all those emissions and chemicals just went in to my garden? 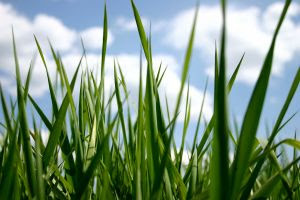 I subsequently learned that lawns are the most irrigated crop in the United States, sucking up an average of 238 gallons of water per person, per day. And so I began my journey toward greener pastures. Live and let live. It never occurred to me that my gardener used chemical fertilizers or pesticides in our yard until I asked him to stop. He did. We both turned a blind eye to a couple patches of clover and a few nibbles in the ornamental plants. Just that simple step removed toxins from the environment and ourselves and reduced polluted run off to our rivers, streams and oceans. Save green, save carbon. I later liberated my gardener along with his gas powered mowers and blowers and found a new life with a push mower and rake. Neither emit greenhouse gases and both actually burn calories! Of course, not everyone has time for their own gardening and, for those who don't, there are certified green gardeners. No matter how much I greened my lawn, though, I realized that a lawn isn't all that green. Bit by bit. I slowly extended my flower beds into the lawn. Then, in the front yard, I whittled away at the lawn's edges or at isolated patches of grass. First to fall victim was the sidewalk strip, then the grass between the pathway and our driveway. Diversify. Grass is a monoculture - a single type of plant planted over a wide area. In it's place, I tucked biodiverse plantings: natives, edibles, and wildflowers. What was once a grassy walkway because a "pollinator" garden buzzing with butterflies, bees, humming birds, finches, and ladybugs. A pepper plant lounged between Shasta daisies and a native monkey flower perked up the corner of the house. Edible gardens make good sense in a down economy. They allow us to feed ourselves for the price of a few seeds and some mindfully applied water. They also shrink our food mile average from 1,500 miles to about 100 feet. Grassroots groups have been begging the Obamas to plant a Victory Garden on the White House lawn and, if the Obamas' new chef is any indication, they just might get their way. Lookin' good. I started by dotting the ornamental looking veggies amongst the flowers in my traditional flower beds. Swiss chard, potatoes, peas, peppers, herbs, and blueberries blend in easily and are quite attractive. Ring the dinner bell. Once I got a taste of homegrown potatoes, there was no turning back. I began planting every sunny patch I could find. Last fall, we grew over 60 pounds of pumpkins. That's a whole mess o' pies. It hasn't been a particularly difficult road to victory, but it has been a tasty one. Will you pick up a rake or shovel and join me? The food's better, here. I promise. I hope this gardening thing is as easy as you make it sound. I've got notes from your posts on GBDs last year, and I'm so excited (but nervous) about planting edibles in my flower beds this year. I would love to do this, but first I would probably need to move to a neighborhood with no home owners association. Great post GB. I have a half acre lawn that is a pain in the arse to mow! I'm lobbying hard to convince Hubby that a goat would be the perfect fix. I don't bother wasting water on it, when it's dead it's dead. (The lawn, not goat.) This year I am making plans to start down the road to victory. In five years I hope to have food not lawn. Great post! I started doing this in small bits last year as well. I mixed Corn into the front bed, here and there. And it resembled the ornamental types. Neighbors loved watching the progression through the season. Herbs and other bits last year too. I have a Nazi Homeowners Association, but obviously no veg gardeners, no one batted an eye! Wow! No wonder you have no shortage of pumpkin puree! I don't have any yard at all -- just a cherry tree and some hydrangeas in front and a brick patio in back -- but I do like to grow food, on my back deck and in my community garden plot. You know what else I would love, besides a giant garden out my front door? Drought-resistant plantings like one of my neighbors put in. She doesn't water them at all -- and they are beautiful! Dude, the new banner is HOTT. Who designed it? Green Rez: Well, there are certainly times when things don't grow right or the slugs get there before you do but it ain't rocket science. Besides, I look at everything as experimentation. I'm still figuring out what grows really well in my area and what not so well. Happy planting!! Dogwood: Probably true. We have no HOA. You could probably get away with some chards or peppers tucked in your flower beds as Personal Garden Coach did (see below). Sheeep: Woohoo! Then you can spend your time worrying about keeping the goat out of the pumpkin patch, as you wrote in your last post. ;-) I still want chickens. Trying to figure out where to stow them. Garden Coach: Great story for those with tough HOAs. My neighbors, too, loved watching how things grew last year - esp the pumpkins and sunflowers. It's something different and interesting than plain ole grass. JessTrev: You have NO idea! If only you lived closer, I'd pawn some of the puree off on you. We have a pretty small yard but sounds like we've got quite a bit more room than you. Good luck with the community plot. Ruchi: Jealous much? And why don't you think that I designed it with my mad graphic design skilz!?! It was a friend of Jess's. Stay tuned for a post about our hot makeover. It felt sooo good to read about green summer days when the world outside my window is completely white. Thanks for that little break from the reality of winter in Canada! I'm so happy to read this post, as I've followed your lawn to victory path for some time now!! : ) Great stuff, GB. And wowza, the site looks FABULOUS. I LOVE IT. That design is awesome! I usually read from my feed reader so glad it hasn't been up for too long.